CPE's experience includes the design and manufacture of a diverse range of special lifting equipment including Pipe Carrying vehicles. 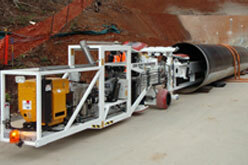 These specialised vehicles can be custom built to suit individual pipes and exact customer application requirements. 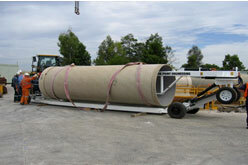 Standard designs are available to suit <1600mm internal diameter 2-12 tonne pipes. Carriers optionally include unidirectional pipe picking capability, pipe jointing XYZ axis alignment, clamp and thrust capability for Pipe socket jointing. 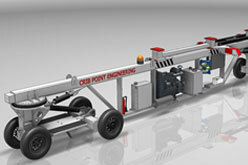 Machine picks load with no counterbalance load therefore reducing machine length and overall weight. 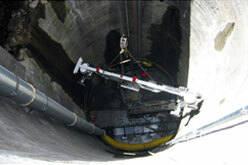 Optional Auto tunnel steering mode to transverse straight or radius tunnel layouts without any wall climb keeping the machine true to the invert at all times. Copyright © Crib Point Engineering.